Just finished planting a small orchard in Northcote. 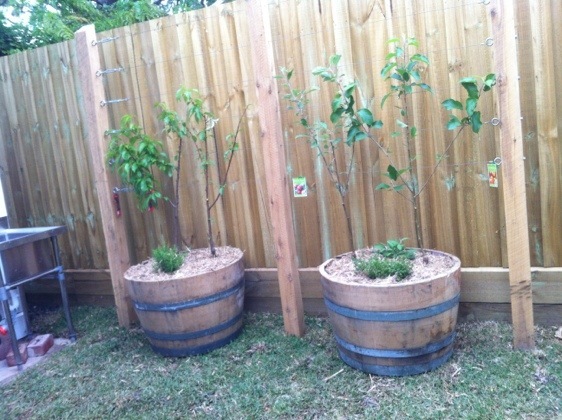 We used 3 wine barrels and managed to fit 7 fruit trees. 2 apples, an early and mid season variety, that spreads the season for fresh apples. 2nd barrel a white flesh peach and a nectarine. And number 3 barrel a Kaffir and Tahitian lime (covered cooking and G&Ts) and a Eureka lemon, all on dwarf root stock which means you get the fruit in a small space. Then to cap it off herbs to fill it all out. So a small orchard and herb garden in a small space in Northcote. All edible.